Currently Serving Delaware County, PA Area and Accepting New Students. I have been playing keys for over 20 years and graduated from Berklee College of Music with a major in Jazz Composition and Music Production & Engineering. I have taught students, teenagers, adult and small children as young as 5 years old. My teaching is focused on stylistic piano playing (chord playing, improvisation, transposition) for students over 10 year old with at least 1 year continuous piano training. I certainly welcome piano training for beginners as early as preparatory level (<8 years old). Digital piano and digital Hammond organ are available at my house for piano tutoring should you choose to come to my location. What do you offer for an advance player? I have taught few classical pianists (with Bachelor's and/or Master's music degree) who intend to learn modern piano playing such as Pop/Rock/Jazz/Blues styles. Throughout my 10+ years of teaching experience, I have developed a guideline and a private curriculum to introduce chord playing effectively, train left hand movement based on a certain style, and how to speak in musician's language. In addition, I will teach students how to learn a certain music feeling (ie a pop song shall sound like a pop song and a jazz song shall sound like a jazz song). Please also see the question about improvisation teaching approach below. Training to 'get' a certain music feeling is not a hard lesson; however, it is a tricky process and requires specific customization based on the student's skill. I have found various ways such as shifting the metronome counting, creating different beat subdivision for the same song and guiding with simplified written improvisation which can help students to understand different styles of music. Should a student already know chord playing, I will fast forward the lesson to sight reading lead sheet/fake books and learning pop, rock or jazz piano playing styles (left and right hands). I will also teach how to transpose (play in different keys) with approximately 6 months of intensive training. Yes, I teach music theory as a part of chord playing for which a basic foundation of music theory is required. I used several book resources for music theory; however, I also have a compact fundamental music theory approach (Not requiring a student to do a lot of paper work. The teaching is done through a repetitive music theory concept, orally), focusing on how to 'visualize' music theory on the keyboard. Should a student want to learn Jazz or a more advanced music theory level (ie college level music theory), I will be happy to provide these. Several advanced topics are harmonic function analysis, modes & modal interchange, chord scale, tension theory, reharmonization, and lydian chromatic concept. FAQ (from a parent): what do we expect after the piano lesson stops? Does the skill fade away quickly? This is a common question I receive. Yes, studying music helps with brain development, but the question was more focused to a student who will be graduating from high school, leaving home for college and may never take a piano lesson again. ​I'd like to point out a piano teaching mistake which I have found from new students who had prior piano training: some students have weak reading skills because their lessons focused on song memorization and allowing too much note name marking on the music sheets. This will lead to forgetting whatever has been learned when a student continues to a new song. While the training still helps the brain development, but a lot of skills can be instantly forgotten in the near future. I teach how to sight read music properly without encouraging song memorization (unless it is required for a performance) or too much music sheet's marking. I teach music theory as a concept and students are reminded of the theory they have learned with each subsequent lesson. I have developed a teaching method that explains how a theory is directly applied such as teaching transposition (how to play in different keys) with approximately 6 months of intensive training and also teaching practical ways to find a chord or a scale. My target is to transform a music student to be an amateur musician after they complete a minimum three years of continuous chord basis piano training with me. Understanding a chord playing correctly and being able to apply music theory independently will last for a long time even after the piano lesson is discontinued (in many cases, the concept won't be forgotten). FAQ (from an advanced adult student): what are your approaches to teach improvisation? For students who never learn how to improvise, or wanted to learn more about modern music (such as moving from classically oriented training), the thought of learning how to improvise can be confusing or even non-existence. Starting with pop songs, I will guide learning improvisation by writing the notes in different colors. Please see the image below, a partial score of My Way, where red color shows improvisation or melody fills. When a student has learned about guided melodic improvisation and would like to learn, let's say, how to play Jazz fully independently (including getting the feeling right). I will provide sheet music that is customized with modified chords and modified melody. The example below is a jazz version of Little Brown Jug. By learning a known song (such as kid's song) with modified melody/or and chord, student will be able to relate different kind of playing styles. This teaching method is further expanded with learning how to play a same song in two or three different styles (such as pop to ballad to bossanova, or bossanova to stride to walking bass/swing). Do you have videos or other media? What is your rate and travel distance? Piano/music lesson starts at $1/minute, with a minimum duration of 30 min per meeting. 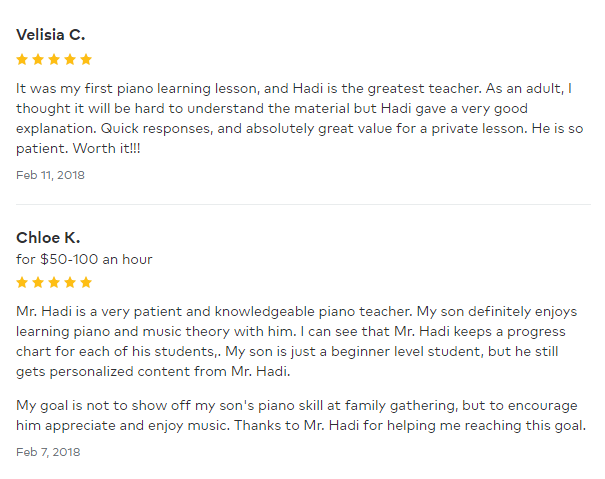 The rate will increase when student passes 3 years of continuous piano lesson to compensate the specific customization and longer preparation time. I will explain in more detail during our first meeting. I recommend 45 or 60 min lesson especially when chord playing is introduced. A mileage fee will be added for in-home lesson and I only travel up to 5 miles radius from my location. How young can my kid start to learn piano with you? Five-year-old is a good young age to start learning piano. At this age, a kid can interact and behave well to stranger's (read: teacher) instructions. However, the success of the training strongly depends on the parent. Parent involvement to make sure their kids practice at home is mandatory. If you (parent) are a piano player, you can start teaching your kid as early as three-year-old. However, there is a very specific technique to work with very young beginners. I taught piano to my son since he was 3.5 years old with a great success (he was able to play 5 songs from memory after 4 months of training). This teaching can only be effectively done daily and internally in a family, therefore I can't accept anyone that is younger than five-year-old. 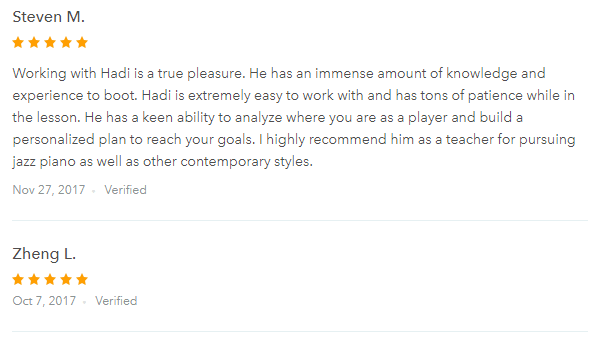 Yes, I offer a 30 min free trial lesson for the first time. This trial lesson is meant to be the initial interview. Please download the lesson policy by clicking this link (PDF). Do you do student's recitals? Currently, I do not do recitals, but I do video recordings after a student acquires a major skill set. I am giving a birthday (or Christmas or New Year) gift to my spouse to learn piano for the first time. Do five lessons adequate to boost his skill? In my professional opinion: No. Piano lesson is a commitment for the lesson itself and continuous practices at home. For beginners, a major development in piano playing is usually seen/felt after completing approx. 20 lessons. That's about 4-6 months range for a weekly lesson. It takes time for the muscles and brain to form a new ability. Therefore, it is useless to take a short period (less than one year) of any kind of musical instrument lessons. It will be forgotten instantly. *See the youtube video (scroll all the way down) for more information about how to practice effectively. Do I need a keyboard or piano at home? Yes, otherwise how will you (or your kid) practice? A piano training will only succeed with continuous practice at home. I recommend a total of 5+ hours of piano playing exposure in a week. ​*See the youtube video (scroll all the way down) for more information about how to practice effectively. "Music study teaches self-expression, discipline and creative thinking"
Please contact me with any questions/inquiries via the KONTAK link above or email directly to hadisumoro at yahoo dot com or text (no call) to Six One Zero - Six One Five - One One Five Two.